Our Nashville Bridal Shop is excited to share that we were featured in the November/December 2017 Issue of Destination Weddings & Honeymoon Magazine, an international publication for the chic bride. 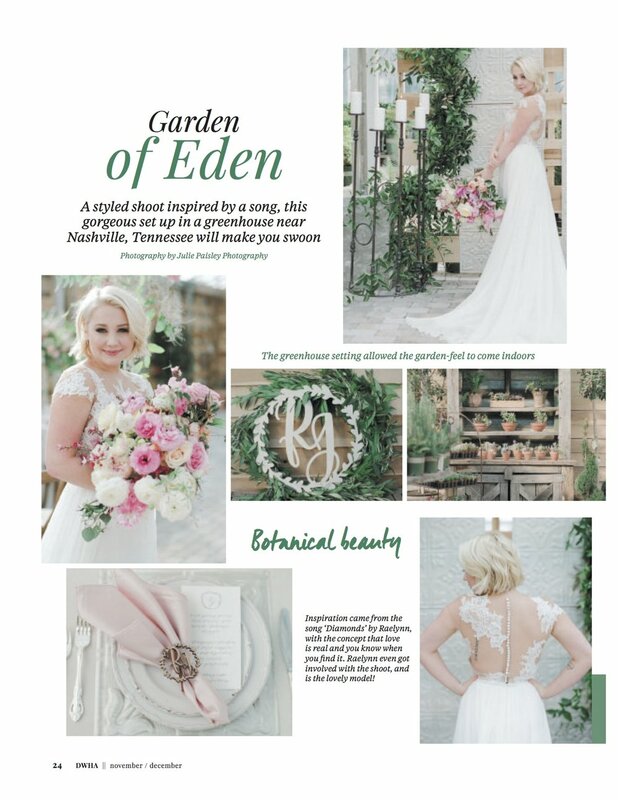 The feature highlighted a styled shoot conceptualized and designed by Heather Benge Events and photographed by Nashville wedding photographer Julie Paisley Photography. Our Nashville Bridal Boutique was honored to share a Pronovias Atelier gown for the styled shoot that included some of Nashville's most sought after wedding vendors. Please make sure to read to the bottom of this post to learn all about the amazing vendors who helped to make this shoot possible. Photography by Julie Paisley Photography. White Dresses Nashville is a bridal boutique located in the iconic Germantown neighborhood of Nashville. Known for their couture gowns with amazing craftsmanship, White Dresses Nashville has been named The Best Bridal Shop in Nashville, one of the 50 Best Bridal Shops in the United States, and as a consistent winner of The Best of Weddings (the Knot). To schedule an appointment at our Nashville Bridal Shop, please call (615) 840-7478.